The European Union launched a procedure Monday that could lead to the temporary suspension of Cambodias preferential access to the blocs market, citing a deterioration in the Southeast Asian nations labor and human rights record over the past 18 months. The long-anticipated move by Brussels came as Cambodias exiled opposition leader called on investors from China, an increasingly important source of economic and political support for Hun Sen as its estrangement from Western partners deepens, to rethink aggressive policies that have made them unpopular in the Southeast Asian country. The European Commission (EC), which coordinates trade policy for the EU, said in a statement that the decision will be published on Tuesday in the EU Official Journal, kicking off a six-month period of intensive monitoring and engagement to determine whether Cambodian exports should continue to enjoy tax-free entry into the European market under the Everything But Arms (EBA) scheme. At the end of the monitoring period, the EUCambodias largest trading partnerwill take three months to produce a report based on its findings, and 12 months from Tuesday, the EC will conclude the procedure with a final decision on whether or not to withdraw trade preferences, as well as the scope and duration of the withdrawal. The EC noted that the procedure does not entail an immediate removal of tariff preferences, which it called an option of last resort, and that it aims to improve the situation for the people on the ground in Cambodia. High Representative for Foreign Affairs and Vice President of the EC Federica Mogherini said that Cambodia had experienced a deterioration of democracy, respect for human rights and the rule of law over the past 18 months, since Prime Minister Hun Sens government arrested opposition Cambodia National Rescue Party (CNRP) President Kem Sokha in September 2017 for alleged acts of treason. Cambodias Supreme Court dissolved the CNRP two months later amid a larger crackdown on political parties, NGOs and independent media, paving the way for the ruling Cambodia Peoples Party (CPP) to win all 125 seats in parliament in a sweep of the countrys July 2018 general election, which was widely seen as unfree and unfair. Mogherini said Cambodias government had taken a number of positive steps since EU Foreign Affairs Ministers made clear in February last year how seriously the EU viewed the developments, but that without more conclusive action from the government, the situation on the ground calls Cambodia's participation in the EBA scheme into question. As the European Union, we are committed to a partnership with Cambodia that delivers for the Cambodian people, she said, adding that the EUs support for democracy and human rights in the country is at the heart of this partnership. EU Commissioner for Trade Cecilia Malmstrom said in Mondays statement that the clock is now officially ticking and we need to see real action soon. When we say that the EU's trade policy is based on values, these are not just empty words, Malmstrom said. Our engagement with the situation in Cambodia has led us to conclude that there are severe deficiencies when it comes to human rights and labor rights in Cambodia that the government needs to tackle if it wants to keep its country's privileged access to our market. The EC said that a fact-finding mission the EU sent to Cambodia in July last year and subsequent high-level bilateral meetings had found evidence of serious and systematic violations of core human rights and labor rights in Cambodia, with a particular emphasis on the rights to political participation, as well as the freedoms of assembly, expression and association. It said the findings add to longstanding EU concerns about the lack of workers rights and disputes linked to economic land concessions in the country. Government spokesperson Phay Siphan on Monday rejected the conclusions of the EUs fact-finding mission, but said Cambodia had already prepared for the decision to launch the temporary withdrawal procedure. Cambodia is already grown, and we are not a young nation, like a child who has to be raised [to survive], he said, adding that the government does not plan to take any reciprocal measures against the EU. CNRP Vice President Mu Sochua, who is living in self-imposed exile following the dissolution of her party, told RFAs Khmer Service Monday that she was concerned over the action by the EU, which accounted for nearly half of Cambodias exports last year and props up the Southeast Asian nations key garment industry. She blamed Hun Sens government for creating the environment in Cambodia that led to the EUs decision. Conditions have been set that unless we respect human rights and democracy, we wont receive [preferential] trade, but Hun Sens regime cares nothing about that, she said. But we Khmer citizens do care about it, since it affects the health of our economy and the daily lives of our people. This is a huge issue, and we believe that the Hun Sen regime must be held responsible in the presence of the Cambodian public. The European Chamber of Commerce (EuroCham) on Monday also expressed regret over the EUs decision, warning of negative consequences on current and future business between the European Union and Cambodia, as well as on development initiatives funded by the EU over the last two decades it said had helped to improve the socio-economic status of millions of Cambodians. We are very concerned that this investigation will send wrong signals about the prospects of the market to potential manufacturing investors during 2019, and that a possible withdrawal in 2020 will have a terrible impact on the employment of hundreds of thousandsoften womenand many more of their dependents, EuroCham Cambodia chairman Arnaud Darc said. Meanwhile, acting CNRP President Sam Rainsy issued a warning Monday in a Facebook post to Chinese investors in Cambodia who he said should be aware of the rancor they are provoking among the local population, particularly in the provinces of Preah Sihanouk and Koh Kong, where, in some places, Cambodians are outnumbered by newly arrived Chinese. Touted Chinese investments often in reality mean land seizures without compensation to make way for civil and military infrastructure projects massive deforestation and other forms of environmental destruction and increases in crime, violence and other social ills, he said. Sam Rainsy, who has said he plans to return to Cambodia from self-imposed exile before March to lead demonstrations against the government, warned investors that the political situation in Cambodia is about to become more and more tense, and that the Hun Sen regime itself is in danger. In their own interests, these investors and Chinese nationals must re-examine their activities and plans, and correct the wrongs they have inflicted on the Cambodian population, he wrote. In a foreign country where they have alienated the whole population, it would be wise for them to be less invasive, less arrogant, and more respectful of the local population, which is liable to explode in anger at any time. Phay Siphan on Monday called Sam Rainsys statement an act of intimidation against foreign investors and part of a bid to destroy the nation. Western influence in Cambodia is on the decline amid criticism of Hun Sen and the CPP over rollbacks on democracy in the lead up to and aftermath of last years ballot. In addition to the EUs moves to drop its preferential trade scheme for Cambodia, the U.S. has since announced visa bans on individuals seen as limiting democracy in the country, as part of a series of measures aimed at pressuring Hun Sen to reverse course. 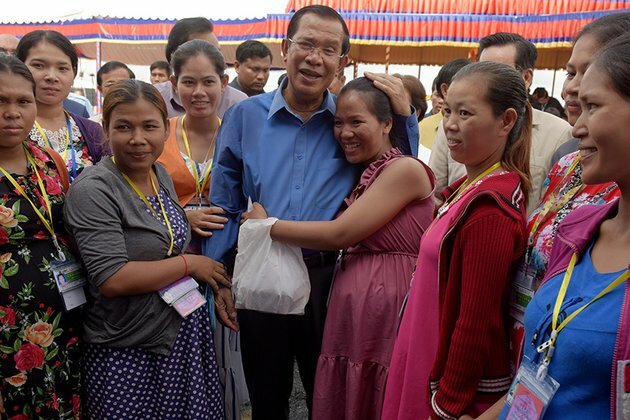 Hun Sen has repeatedly stressed that his country does not need foreign governments to recognize the legitimacy of Cambodias elections, saying acceptance by Cambodians is sufficient. He has also said that he will continue to welcome aid from China, which is currently Cambodias largest international aid provider and typically offers funding without many of the prerequisites that the U.S. and EU place on donations, such as improvements to human rights and rule of law. Trade volume between Cambodia and China was valued at U.S. $5.8 billion in 2017, up 22 percent from U.S. $4.76 billion dollars a year earlier, while China is currently Cambodias largest investor, and has poured U.S. $12.6 billion into the Southeast Asian nation from 1994 to 2017. Reported by RFAs Khmer Service. Translated by Sovannarith Keo. Written in English by Joshua Lipes.